An aquatic weed. Banned in some countries (and states of USA) due to its rapid growth and clogging of water. However it is also a common beginners aquarium plant as it's often to be found on sale very cheaply in pet shops throughout the world. It is a good oxygenator and due to its rapid growth it will reduce levels of Nitrate in the tank. Recommended low light, fast growing plant. Can be floated or planted. If floated it makes a good cover for fry. Propagation by lateral shoots. Known to melt if exposed long term to Seachem's Excel product, bleach, or extended periods of elevated temperatures. DO NOT RELEASE THIS PLANT INTO THE WILD! 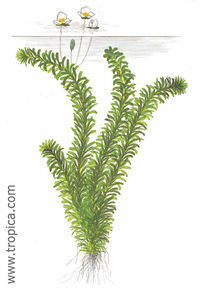 Fish that like soft tissue plants love to eat this plant. Research your fish first. Crayfish also will eat this. This page was last edited on 19 August 2011, at 12:19.